Update 19.11.2018: Checkout my experimental implementation of a Metrics-Client Library for CosmosDB on github. With Azure Monitor you have a single way to access metrics for a lot of supported azure resources. My personal guess on how the implemented Azure Monitor is that each Azure Resource provider (like Microsoft.DocumentDB) built an addon-provider „microsoft.insights“ that is used by Azure Monitor. Azure Monitor only supports these metrics for CosmosDB. The Azure Monitor REST API documentation to query metrics describes the input and output values. These and more metrics can be retrieved directly from the CosmosDB Azure Resource Provider. This was/is the „old way“ to retrieve metrics before the arrival of Azure Monitor, if i got that right. The reference chapter describes all the various metrics you can consume from CosmosDB Resource Provider. While Azure Monitor provides a nice nuget package (enable preview!) that you can use to access Azure Monitor metrics, you need to work with the REST-API to access the other metrics. In this article I will focus on the DocumentDB metrics retrieved by REST (also the Azure Monitor ones). You can find a Azure Monitor Sample with .NET Core here. You can find out which regions your CosmosDB is available by querying the ARM REST API of the CosmosDB Account Azure Resource. Use the „Resources Get REST API“. For CosmosDB you find the documentation on how to retrieve the details of the CosmosDB Account Resource here. 2018-10-10T06:55:00.000Z to 2018-10-10T07:55:00.000Z with a 5 minute interval (PT5M). Since the resource uri path points to a specific collection, only the data of this collection is retrieved! This request will fetch the „TotalRequests“-metric within the timespan from: 10.Oct. 2018 07:57 to 10.Oct. 2018 08:57 (one hour). The result will be delivered in 1 Minute invervals (PT1M). In this case we want all Databases, Collections, Regions and StatusCodes. The azure portal on the CosmosDB metrics blade currently uses this API-Version: 2017-05-01-preview. There is a more recent one „2018-01-01“. To get the supported API-Versions send in a wrong one :-). Note that the new version requires „metricNames“ instead of „metric“! For the „DocumentDB Collection Partition in a specific region“ I missed out the documented „partitionId“-value in my results. I got only „partitionKeyRangeId“. I also got a „region“-value for each entry in my value array. The portal uses the MAX value of all retrieved metric values to display the MAX-RUs for a partition. This request had been used in the „Overview-Tab“ as well. The result is basically grouped by Database, Collection and Statuscode. So we can filter the 429 requests to get result we need. The generic result structure is documented here. Within the the value the Metric ID will be „/subscriptions/12a34456-bc78-9d0e-fa1b-c2d3e4567890/resourceGroups/myRG/providers/Microsoft.DocumentDb/databaseAccounts/cosmosDBAccount/providers/Microsoft.Insights/metrics/TotalRequests“. I was really missing out a single page that describes all the metric possibilities with CosmosDB. I hope that this fills the gap. During local development, I often use Azure CosmosDB emulator instead of having a running instance in the cloud. Naturally, my unit tests also use the emulator. Since our gated check-in requires all unit tests to complete we need to find a way to complete all tests in Azure DevOps. Luckily there is this handy pipeline task from the Visual Studio Marketplace at hand! In case you never heard of Azure DevOps (formerly known as VSTS) or Azure pipelines you can get a good overview here. You can sign up for free for Azure DevOps here. For our purpose I have created a new MVC Asp.NET Core 2.1 web application in Visual Studio including an additional .NET Core MSTest project ‚EmulatorDemoTests‘ which will contain my unit tests. For the test project i created a file „.runsettings“, which is required to configure the access to our local cosmosdb instance. I have written a simple test case which will suffice for our little sample. You can find the complete code on GitHub. To enable Azure CosmosDB Emulator in you CI/CD pipelines you need to install the Azure DevOps pipeline task. Navigate to the Azure CosmosDB Emulator Task in your browser and click „Get it free“ – Button. After authentication with either your organizational or Microsoft account you can choose the DevOps Account you want to install this task to. In case your devops account is located at https://youraccount.visualstudio.com your account will be listed as: „youraccount“. Click „Install“ and after the successful install „Proceed to organization“. Select your DevOps project. Click the Pipelines menu and create a new pipeline by clicking on the „New pipeline“ button in the center of the screen. First select your pipeline source. You have a varity of options to host your code including DevOps Repos, TFVC, GitHub, GitHub Enterprise, Subversion, BitBucket or any external git repository. In this case just use „Azure Repos Git“ as the source is stored in the DevOps project. The initial pipeline looks like this. Since no emulator is running in the DevOps envionment the tests will fail. Now you can select the + sign in the agent job section and add a new task „Azure CosmosDB emulator“ from the „test“ category. Use drag n drop to move it between the tasks „Build“ and „Test“. It is important to know that the CosmosDB Emulator Task will export an pipeline variable „$(CosmosDbEmulator.Endpoint)“ which will contain the endpoint where the CosmosDB instance will be available. Now you need to configure the „Test .NET Core“ task to have the unit tests use the endpoint of the emulator you just created. While you can configure a runsettings file, there is currently no way to override parameters (see this open github issue). Therefore you need to work around this limitation. First of all configure the test task to use a runsettings file that does not yet exist. Right now there is only a „.runnsettings“ file in that folder. Next use a small powershell script task to create this file dynamically. Click on the +-Icon in the „Agent job“ section and find unter the category „Utility“ the task „PowerShell“. Place that script between „Run Azure CosmosDB Emulator“ and „Test .NET Core“. Now you need to configure two pipeline parameters as environment variables within the script. Open the „Environment variables“ section and configure those values. Attention: Environment variables MUST NOT contain a „.“. Add your little script. Make sure to select Type = Inline. and copy the following script into the script text field. In a production environment I usually would use Azure Functions which use the Change Feed Processor Library internally to continuously push changes in my CosmosDB to other destination(s). However, for some small testing scenarios, demos and also some coding fun, I decided to add ChangeFeed support to the Azure CosmosDB data migration tool (link to original version). You can select where you want start reading from the change feed. Either start at the creation time of the collection or select a specific date. I admit I could have added a DateTime-Picker :-P.
At „File to read/store continuation tokens“ you can provide a file name to store the continuation tokens. If you re-run the wizard and provide the file again only the new updated documents will be processed. Last but not least you need to set, if you want to update the provided continuation token file with the new continuation tokens which in most situations is desired. Create a new Cloud/Azure Functions Project in your „Work“-Folder. 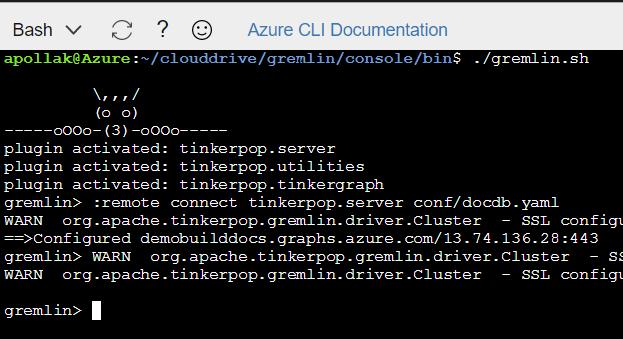 c. DO NOT INSTALL „Microsoft.Azure.DocumentDB“! This will result in a binding issue, as WebJobs SDK uses a different instance of „Document“ class (v. 1.13.2)! greeting = $"Will upsert document!" error = "Document was empty!" Either in Azure Portal or with a tool like „DocumentDB Studio“ create a new collection „democol“ within „demodb“ Database in your CosmosDB Account. Start your Azure Function App in the Debugger and fire up a tool like „Postman“. Verify the output in the console window and if the document got written to your documents collection. greeting = $"Will upsert documents!" error = "No documents where provided!" Run this sample again and post an array of JSON Documents instead. Verify if the function works and the documents have been upserted to the CosmosDB collection. Well, not how the data is stored internally, but rather how CosmosDB seems to handle data that is stored and accessed via Graph, Table or MongoDB API. Each of these collections/graphs that have been created with the new available APIs can be still accessed with the “native” DocumentDB SQL API. To date it remains a mystery for me if the CosmosDB Team just uses the “classic” api to provide all these alternate APIs on top or if uses some magic behind. Please note that while accessing CosmosDB Graph/Table/MongoDB data with DocumentDB SQL is quite interesting it is not something to use in production and probably not supported by Microsoft. Microsoft might at any time change their way of storing this data in CosmosDB and your code might break. The first three sections will describe “Graph-API”, “Table-API” and “MongoDB-API”. 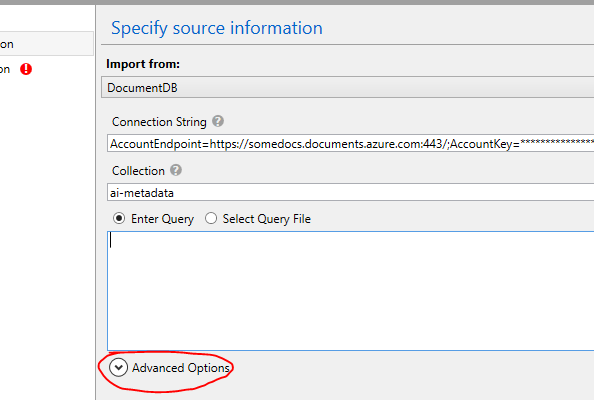 The 4th section explains how you can change the visual portal experience in Azure and in the 5th section I try to do create documents with DocumentDB API and try to query them with the graph API. In parallel I use Azure DocumentDB Studio to connect to my graph with the regularly DocumentDB SQL API. 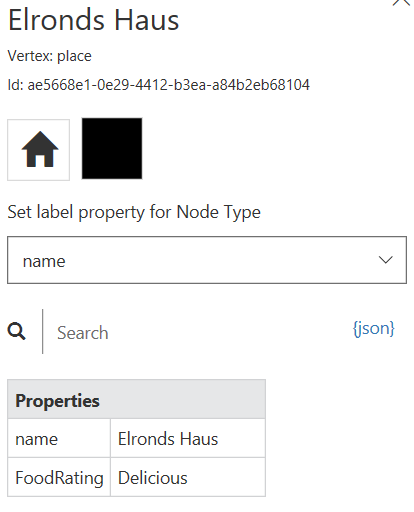 If we select “Elronds Haus” in Graph Explorer we can see the Vertex-ID and the properties to this vertex. 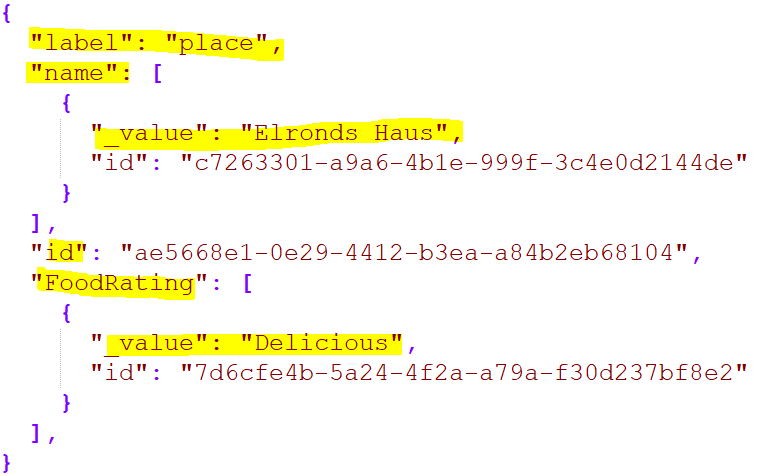 In Azure DocDB Studio we can now issue a query on the collection to reveal the vertex for “Elronds Haus”. To reduce complexity I removed the internal fields like _ts, _etag,_self,… in the images. 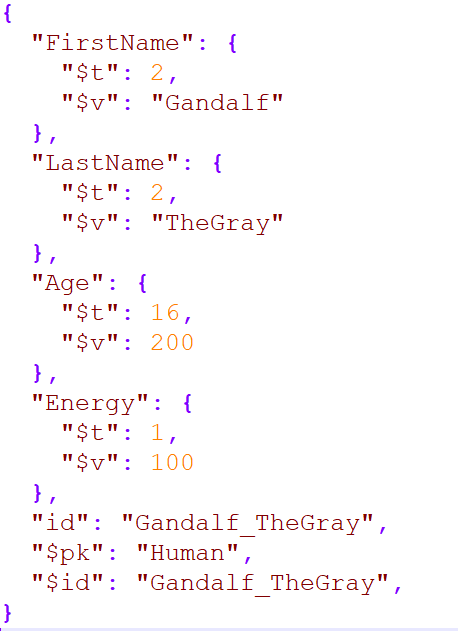 Id and Label of the vertex is just stored as normal JSON fields, but the properties are stored as a combination of _value and some unique property id field. The edge interestingly stores it’s properties different and more easy to query with DocDB SQL. we need to issue a more complex query to find a specific vertex by a property value. I’m not sure why they decided to store these properties as array, but maybe this is required for some graph functionality I am not aware of yet. In this video Rimma Nehme (@rimmanehme) mentioned at 37:20 that the SQL-Extensions will be available at a later point in time enabling you to query the graph with SQL instead of gremlin. In this case I use the new Table API of CosmosDB. While you have the same namespace and same API in .NET you need to replace the old Storage nugget package with a new one to have it work. 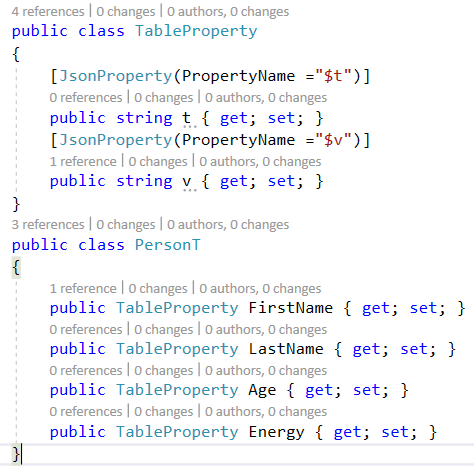 I created three instances of PersonEntity that derive from TableEntity as you would expect with the Storage Table API. The store the race of the person as partitionkey and a combination of first and last name as row key. As soon as you create a new table with the CreateIfNotExistsAsync() method a new database “TablesDB” will be created in CosmosDB with a collection named after your table. Keep in mind that the API will create a new collection for every table! It might be better from a cost perspective to store various kinds of documents into one collection! 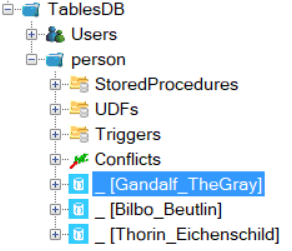 As soon as we add the entities to the table we can see them in DocumentDB Studio. 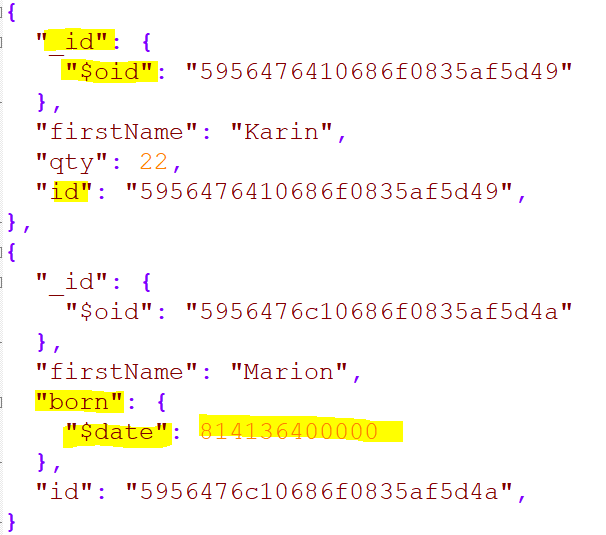 Because we used a combination of first and last name as rowkey we can see that the rowkey repesents the “id” field of the CosmosDB entry. What instantly pops into our eye is the use of the $ sign which will cause some trouble constructing DocDB SQL statements as we will see. Like in the graph API we have multiple fields defining a property. I find this more approachable as this naming reduces the size of the document. (“_value” vs “$v”). The partitionkey is stored as $pk. CosmosDB stores the type of the properties within it’s $t field. Where 2=string, 16=integer, 1=double. First we will create two simple entries with the native MongoDB Client where I add two documents. The second document also uses an ISOData type for date/time. You can see that MongoDB also stores the ID as ObjectId type. There seem to be some issues with other BSON Types though. For example there is an article mentioning some compatibility issues with SiteCore and CosmosDB MongoDB API and I believe it is related to the yet unsupported BSON Type BsonInt32. As far as I have seen (I lost the article in the web ) currently only ObjectId and ISODate are supported types in CosmosDB MongoDB API. 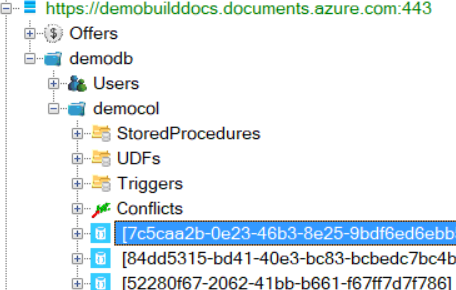 Again if we now examine those two documents in Azure DocumentDB Studio we can see that id is stored twice. First as “id” and second as [“_id”][“$oid”]. Another way to declare the data type of fields. The field of type ISODate is stored as EPOCH value. This will with all APIs except with MongoDB. The reason for this might be legacy . If you take a look at the ARM-Template to create GraphAPI, TableAPI, MongoAPI and DocumentDB API you will notice that while as CosmosDB with MongoAPI has set “kind” property to MongoDB, all others have set it to GlobalDocumentDB. All other APIS rely on the tags collection within the resource definition. 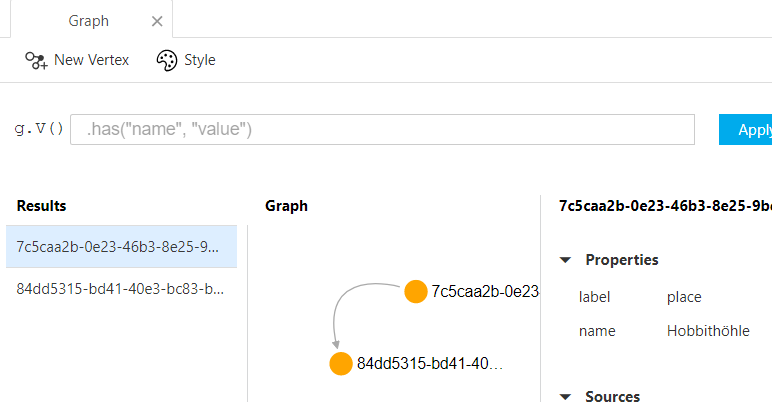 So to change the Table Experience to Graph Experience is to remote the “defaultExperience:Table” tag and add a new “defaultExperience:Graph” in the portal and reload the page. Now we have figured that out, I wonder if I can take a “normal” DocumentDB API collection, fill it with data that looks like what we have created with GraphAPI. 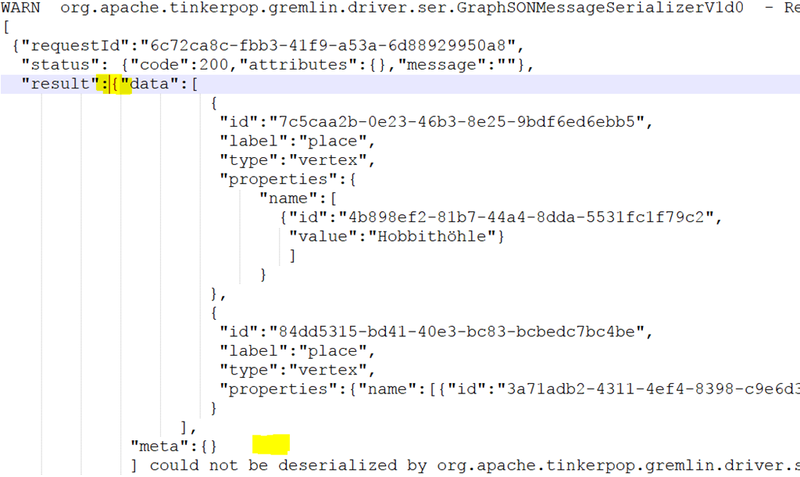 Then change the experience to GraphAPI and see if we can access the data via Gremlin. For that purpose I have set up a brand new CosmosDB with DocumentDB API “demobuilddocs” in the portal. I am again using the Document DB Studio to create a new collection and three documents to it (You can download the documents here!). In DocumentDB Studio I create a new single partitioned collection “democol” with 400 RU/s for “demobuilddocs”. Then I create the three documents with CTRL+N (Create document in context menu of collection). So that’s it. Next try that with GraphExplorer and it works all fine as well. Now lets try that with the cloud bash and gremlin client. (Spoiler: Will break! – No it won’t. It would break if we used ö,ü,… in the JSON). First I copy my hobbit.yaml connection configuration to doccb.yaml and edit it with nano to point to the graph url “demobuilddocs.graphs.azure.com”. Please note that GraphExplorer which uses the .NET CosmosDB SDK will connect to “demobuilddocs.documents.azure.com”. Then I add the path to my collection and the primary key as password (I have truncated that for security reasons). And lets query for edges and see how that works. Now when we read the vertices we will get the correct result. Now lets try that with vertices and see it break with an Decoder Exception. It is missing some strange close marker for OBJECT. A .NET implementation btw like GraphExplore can handle the mutated vowels without any problem. But you might want to look out for this error in a Java Client. If you examine the exception you can see that the resulting json misses some closing brackets. P.S: If you create a new vertex in the gremlin console, you can query that with no problems. But if you replace that document by just changing the value of a property with DocumentDB Studio you have the same error if you query the vertex with the gremlin console. Obviously Microsoft is storing more data than meets the eye . On the other hand it is interesting to see the .NET Client SDK to work. 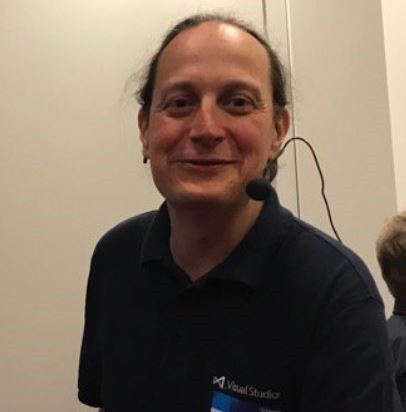 Auf der Veranstaltung //BUILD on Tour gestern bei Microsoft Österreich durfte ich einen Vortrag zum Thema “CosmosDB” halten. Die Slides zu meinem CosmosDB Vortrag könnt ihr hier herunterladen. 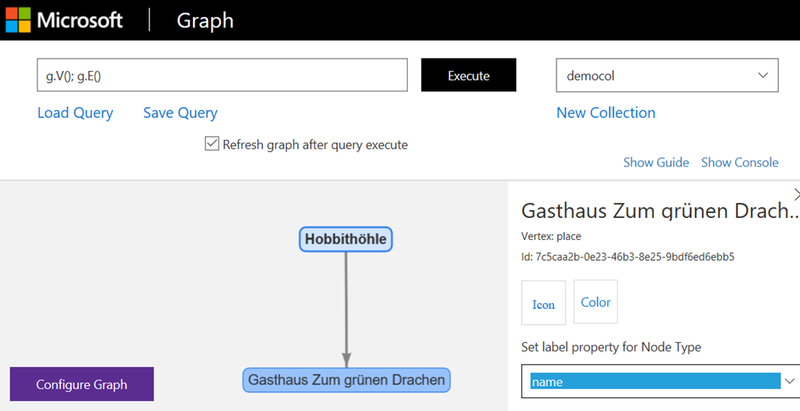 Auf GitHub findet ihr meinen Source Code zum CosmosDB Vortrag und hier das Azure CosmosDB Graph Explorer Beispiel. 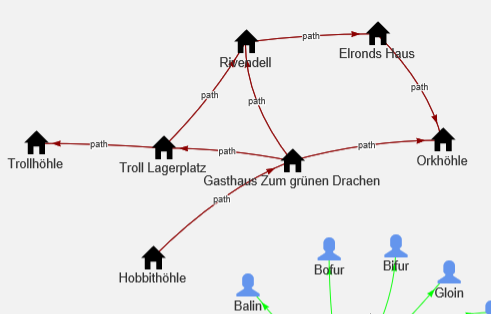 Hier auch die Gremlin Queries für das Beispiel aus The Hobbit. Aja, nachdem es für einige Verwirrung gesorgt hat. In CosmosDB gibt es nur Request Units (RU) pro Sekunde/Minute und keine Orks . Obwohl es hätte was.